The Delaware KIDS Fund donated 50 tickets to the Greater Newark Boys & Girls Club of Delaware for the Saturday, October 9th game between UD & Maine at Delaware Stadium. Thomas J. Hanna (president & CEO of The DE KIDS Fund) presented the tickets to Leslie McGowan (Greater Newark Boys & Girls Club of Delaware) in an effort to entertain local children that may not have means of enjoying a University of Delaware Football game. Each child enjoyed Arby’s lunch, transportation to and from the game, one ticket to the game, one t-shirt, and popcorn and soda to enjoy at Delaware Stadium! 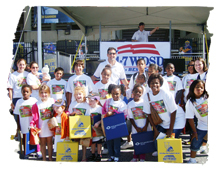 Sponsors included: 94.7 WDSD, Harvey, Hanna & Associates, Arby’s, Sutton Bus Company, National 5 & 10 on Main Street and The Delaware KIDS Fund.